She Left Her Babies Alone in a Car: Criminal or Mom Misunderstood? Phoenix mom Shanesha made headlines last year after she was charged with two felony counts of child abuse for leaving her two young sons in a hot car during a job interview. 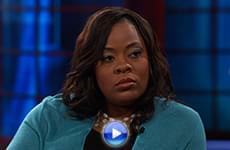 She opens up to Dr. Phil — in hindsight, does she think she made a mistake? After Shanesha’s arrest, supporters raised over $100,000 on her behalf. She was offered a deal to avoid prosecution, but it required her to allocate donated money to a trust for her children. Did she comply? And, how does she respond to allegations that she has misused donations? Plus, how can Shanesha move forward? Shanesha says in March 2014, she landed a job interview she hoped would be her big break, after having lost her job and becoming homeless. But the single mom says her babysitter fell through at the last minute. Believing the interview would take only 15 minutes, she decided to leave her sons, ages 6 months and 2, in the car. Shanesha says when she left the interview, she felt “on top of the world.” But everything came crashing down when she reached the parking lot. A passerby had seen the boys and called police. Shanesha was charged with two felony counts of child abuse and spent 11 days in jail. Shanesha’s tearful mugshot attracted sympathy from across the country, and donations poured in to a crowdfunding page set up on her behalf. But Shanesha later became the target of backlash when she reportedly missed deadlines to fund a trust for her children. 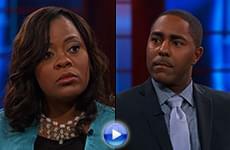 Shanesha‘s former attorney says he got her the “deal of a lifetime.” Why does she disagree? How does Shanesha say she has used the donated money? Tune in: What does the woman who started the fundraising page have to say? Plus, Shanesha recently took a deal and pleaded guilty to one count of child abuse. If she could go back, would she do anything differently?